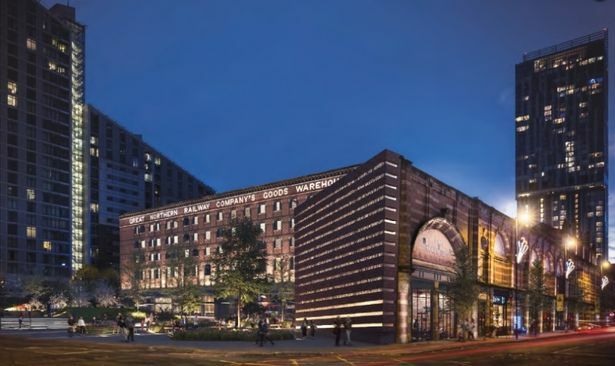 The last few years have seen a major ramping up of innovative new construction projects taking shape against the Manchester landscape, and 2019 will see many of these thrilling developments finally reach fruition. From the glittering promise of the Tower of Light, through the record-breaking skyscrapers of Deansgate Square, to the long-troubled development of Gary Neville’s St Michael’s project, we’ve picked out the top five emerging constructions to watch out for in the year ahead. Let’s kick off by shedding some light on one of the most intriguing construction projects that Manchester has even seen. 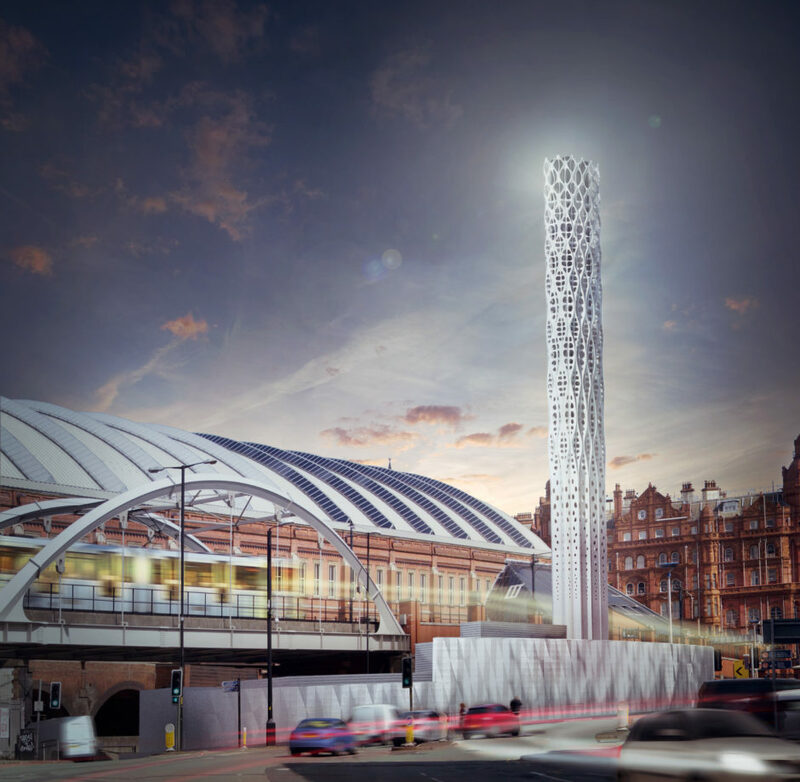 The Tower of Light isn’t just going to be a stunning new iconic landmark for the city centre – it’s also going to play a vital new role in powering up the neighbouring buildings and businesses. Situated in Manchester’s Civic Quarter near the former GMEX, the Tower of Light is actually a flue tower and façade which will house the Vital Energi CHP Energy Centre. This new eco-friendly ‘civic heat network’ will use hot water channelled through underground pipes to deliver power to the Central Library, the Manchester Art Gallery, the Conference Centre, the Town Hall and more. 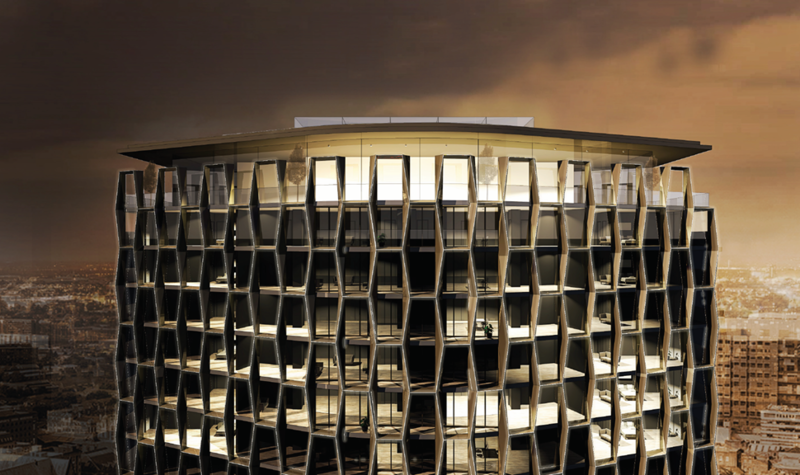 Tonkin Liu won the contract to develop the £18m project in collaboration with the Arup Group. The 40m tall tower will become alive at night, illuminating the civic quarter with a stunning LED display and serving as a beautiful visual reference of the city’s ongoing commitment to renewable energy. Manchester looks set to stretch even further into the skies in 2019 and beyond. For 12 years, the Beetham Tower has held the record for the UK’s tallest building outside of London at 169m tall. The construction of the South Tower in the new Deansgate Square development has already surpassed that height despite that fact that it won’t be fully completed until later this year. Upon completion, the South Tower will reach 201m in height, becoming not only the new tallest building outside of London but the 5th tallest in the whole of the UK. The South Tower is the focal point of the Deansgate project located south of Deansgate railway station, sandwiched in-between Commercial Street and Owen Street. In total, the project developed by Renaker Build and designed by SimpsonHaugh and Partners will comprise four huge towers which will be used for business office space. Legal and General are set to take control of the whole West Tower when it’s completed later this year, with the other two towers scheduled for completion next year. However, the South Tower possibly won’t hold onto that height record for a great deal of time. Trinity Islands is yet another exciting new construction proposal for the city. 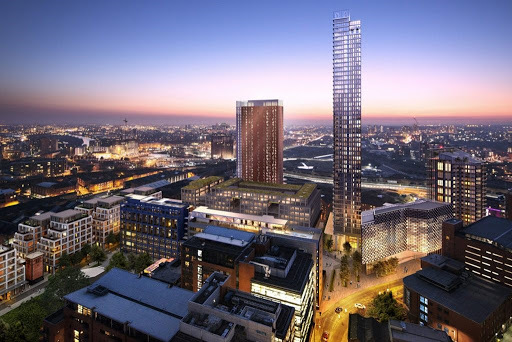 Dubbed ‘Manchester’s first Vertical Village’, the project is not yet officially green-lit but it would be scheduled for completion in 2022 and includes plans for a 213m tall tower designed to house hundreds of new homes. It’s been almost exactly twenty years since the last major refurbishment of The Great Northern Warehouse, situated at the junction of Deansgate and Peter Street. We’ve seen acknowledgement from the council that the 1999 Leisure Complex revamp didn’t quite hit all the targets, and the current joint owners – Trilogy and Peterson Group – are on a mission to give the old Victorian landmark the 21st century transformation that it’s long deserved. Leaked plans from a couple of years ago now seem to have been completely redrafted after negative reaction to a proposed new structure in the outside square which resembled a giant Triffid. Instead, SimpsonHaugh and Partners have been tasked with opening up a vibrant new outdoor public realm containing pedestrian routes to improve connections across the site, with beautiful foliage and outside seating creating a new ‘Green Oasis’ for Manchester. 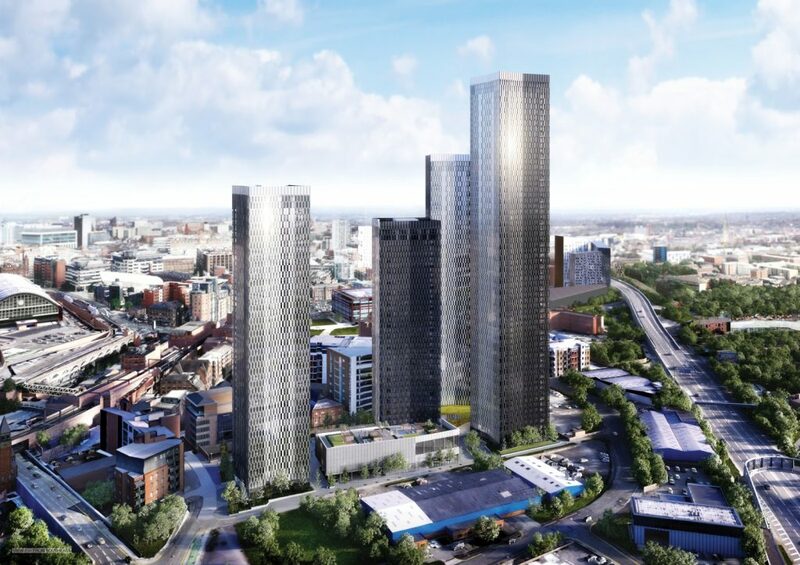 We’re losing the large tower which didn’t seem to serve any useful purpose in the first place, while the Deansgate shops will undergo major refurbishment and the current upper-level warehouse parking spaces will be replaced by luxury new apartments. Here’s a truly epic £1.35bn construction project under development by Manchester City Council and Allied London. Spanning the site of the former iconic Granada TV Studios in the centre of the city, but stretching out as far as the Museum of Science and Industry, and Water Street’s Marriott Hotel, the project will create 2,500 new homes, 600,000 sq ft of workspace for the creative and arts industries, and 400,000 sq ft of new leisure space. One of the big talking points of the whole project is the development of ‘The Factory’ – a new arts and culture venue named after the late great Tony Wilson’s legendary record label. This new £110m flexible space will accommodate 7000-strong audiences and will become the permanent new home for the Manchester International Festival. The St John’s Project also includes a new 52-storey tower with hotel space, the Albert Lofts residential buildings, the Manchester Goods Yard, and the new ‘South Village’ comprising eight buildings built on the former set of Coronation Street. The spirit of Granada Studios will still live on, courtesy of the red neon sign that will become a part of the 200-bed Grande Hotel. The opening ceremony is scheduled for late 2019. Here’s the most famous – and we believe the most exciting – of all the construction projects planned for Manchester in 2019. But it’s certainly been a long, tough battle to get the St Michaels project off the ground. Ex-professional footballers Gary Neville and Ryan Giggs were part of the consortium behind a £200m proposal to transform the Jackson Row site into a new landscape of skyscrapers close to the Town Hall. But the project was initially met with fierce criticism from many quarters, including the Historic England heritage watchdog who claimed that the proposal would dominate and undermine the Grade-1 listed Town Hall and nearby conservation area. 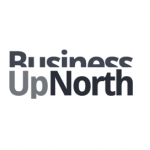 The plans were ripped up, and Manchester-based architect Stephen Hodder was brought into deliver a new blueprint which was given the official green light last year. The new St Michaels project will comprise a single 134m tall tower and a nine-storey office building. The new skyscraper will include luxurious hotel apartments, offices, a new synagogue and even a beautiful roof garden. We think St Michaels is destined to transform the Manchester skyline forever, and in the most breathtaking way imaginable.